Neighbors, bank employee and helpers are shown getting ready to shred old documents with personal information at Community Savings Bank’s Shred-a-thon on May 7th. 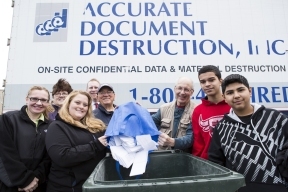 They joined hundreds of neighbors in shredding documents as a good way of combatting identity theft. A truck with a mobile shredder was parked in the bank’s parking lot from 9am to Noon.